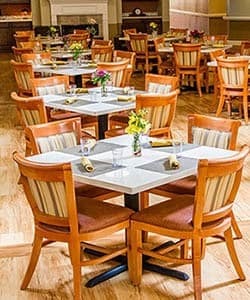 The Phoenix at Roswell offers a culinary experience parallel to traditional family style dining. It’s not just the people that make our dining superior. It is also the delightful signature recipes of our renowned chefs. We provide fresh and nutritional options. Our comfortable family style dining promotes social wellness for all seniors. For each meal, our skilled chefs are happy to address any special dietary modifications or restrictions. International meals and fanciful desserts make meal time an extraordinary culinary experience daily. Stop by and visit us for a delicious treat!